I want to tell you about two useful nautilus extensions. 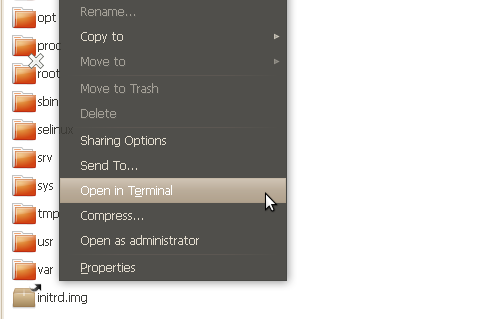 The first one lets you right-click on a folder and you get an option in the pop-up menu to open a terminal at that location. 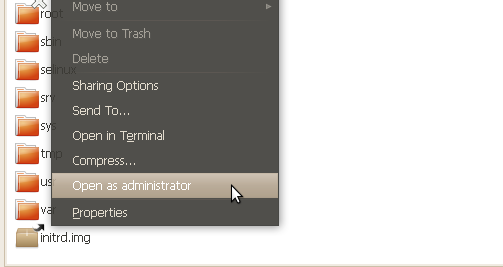 The other extension allows you to right-click on a folder and you get an option in the pop-up menu to open as administrator. This will open another nautilus window, running as root, at that location. This is especially handy when you need root privileges for a quick task. For example, when you need to modify a folder or file which you don’t own. Here is how you install both of these using the cmdline. Close any open nautilus windows. Now force nautilus to restart. You are done. Any new nautilus windows that you open will have the new extensions whenever you right-click a folder.